To be more of a wiz at your calling in life, you can employ some of the closely-guarded techniques of wizardry that “magically” empower your thoughts and expressions. These procedures are at least as old as recorded history, and because they underlie myriad belief systems, they’ll be compatible with whatever worldview you may hold (even if you consider yourself wholly unspiritual). It may surprise you to know that a framed vestige of these methods is likely hanging in your home or office right now — a parchment emblazoned with ceremonial calligraphy, evocative seals, and the hallowed names of higher powers. A diploma is, indeed, a secular talisman complete with carefully formalized language, circular symbols of revered institutions, and the signatures of authoritative figures. As a talisman, a diploma acts in several ways: it’s an open-sesame to quite literally open new doorways to opportunity, it’s a magnet for respect, and it’s a beacon to attract affluence. A diploma is a simple, secular echo of a more elaborate set of wizardly techniques. 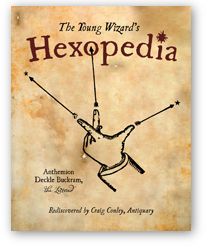 Handed down through generations, these wizardly ways encapsulate a technology for carefully focusing the words of your intention. You might liken the technique to a ritual or, if you prefer, a solemnity, though it’s seriously fun. In a nutshell, there is a prescribed way to thoughtfully set your goals in writing by arranging key words on a page. The meditative process is similar to “mind map” diagrams, though this technique is not about brainstorming but rather efficaciousness. Historically, to benefit from this technique you’d have to consult with your local shaman, medicine man, wise woman, or magus, who would create a talisman for you. While it never hurts to seek expert help, there are proactive ways to jumpstart your own progress. Just to be clear, the magical spirit you’ll be conjuring is your own inner being, your own highest self, via the primordial power inherent in words and symbols. Let’s go old-school and use a pen and paper. The model we’ll use goes back to what was called a “lamp charm” in antiquated India, whose original purpose was to beseech the genii of the lamp, on behalf of the wise King Solomon, to burn up whatever fairy or demon was wreaking havoc. Your own talisman can appeal to the genius residing in your best self—whatever power you mustered the last time a situation felt impossible but you managed to get through it all the same.